I purchased the shoes above this past week at a Cole Haan Store in the Highland Park Village, Dallas Texas. The biggest issue was getting them into my travel bag to get them back home. The store was closing and I was undecided between buying male shoes, badly needed for work, or buying these heels. It is obvious what won that battle. One of my reasons for liking this so much was that I had seen the above beautiful Michael Kors purse a few weeks back. I love bucket bags and the shoes do match the bag. I guess another “Feminine Differential” is the matching of accessory items. Most of time I am not fixed on matching but when two items can and do work so well together, why not. Matches my hair too. Here are the shopping details. One link is for the purse at Neiman Marcus and the other is Nortstrom. Nordstrom's is 40% off. Shop around on the shoes. If in Dallas, check the Highland Park Village, Cole Haan store. It is offering a 40% discount on all merchandise until it closes/moves. The link for the shoes is the Cole Haan on–line site. Signing up gets you e-mail notices for their sales. Over the next few days I am going to post a few beautiful shop windows that that I photographed. WOW, gorgeous merchandise and displays. Some of the most incredible shoes I have ever seen. Shoes or art - Not sure. A great place to walk around and "Window Shop". Do people still do that? Python-embossed and smooth leather bucket bag. It’s unanimous: the Fair Haven is pump perfection. 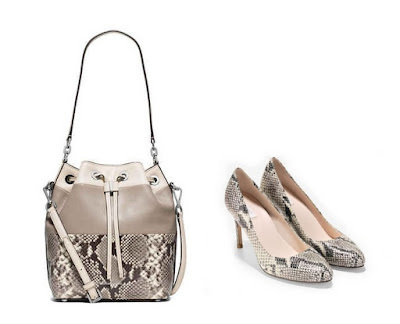 With an almond toe and an 85 mm heel, this elegant silhouette is wrapped in sultry snake print leather. Whether Fair Haven is finishing off workwear or wedding looks, this versatile style will remain a chic choice season after season. Featuring a full leather lining, the shoe is constructed with our Grand.OS technology in the outsole, making it the ideal choice for all-day wear. Anything special you have purchased recently? Share!